I have a .csv file export (actually printed to csv file) made on a Windows 10 machine. 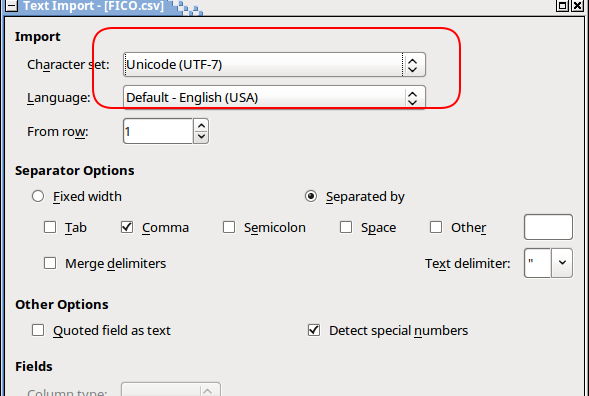 Working in Libreoffice Calc on Archlinux, Why can Calc open a file using settings Character Set: Western Europe (ASCII/US), but saved file and reopened, the file acts like utf-8? A little background. I'm doing some Python scripting with Juypter Notebooks to generate import files and the application requires ASCII TDF. There are special characters which the app uses which I can't alter and must be present in the import file. I'm testing the import using Calc csv files, before testing the script output. I need to be sure each step doesn't bork the ASCII characters. Calc is part of that process. Calc should ask for the Character set on import. Not the answer you're looking for? Browse other questions tagged windows csv libreoffice-calc character-encoding ascii or ask your own question. How to copy paste as raw csv from formatted csv file using LibreOffice Calc?